When it comes to late-night comfort food, it's hard to do better than a stuffed-to-the-gills burrito served up by any one of our local fast-casual Mexican eateries. Recently, I've come to appreciate the gigantic, hangover-destroying might of the breakfast burrito, which led me to the question of all questions: Which place does breakfast best? Seeking an answer, I visited six different—yet startlingly similar—Mexican joints around town to see what each place was packing. Before we get to the judgments, however, let me explain the ground rules. Taking a page from Colin Atrophy Hagendorf's memoir Slice Harvester, in which the author ranks New York pizzerias by the quality of their plain cheese pizza, I decided to stick to the most customary form of breakfast burrito: ham, eggs, cheese and potatoes wrapped up in a blanket-sized tortilla. I also eschewed the different salsas and garnishes available—a grave sin, I know, but I was going for something purely foundational. Those thinking that one breakfast burrito is very much like another need to think again. The nuances at play here actually are quite impressive. Let's get started, shall we? I have a feeling that Alberto's might be concentrating their strengths outside of the breakfast burrito realm. Alberto's had the best tortilla by far—warm, chewy and crisp in exactly the right places. They also serve up the most expensive burrito on the list, which means you can get more for your money elsewhere. The most fascinating part was catching the smoky aromas of a well-utilized grill with each bite. It was food cooked on the same surface that wrought greatness elsewhere, which made me think that Alberto's true power lies within another burrito on their menu. Discovering this Excalibur among burritos has become my most recent food quest. 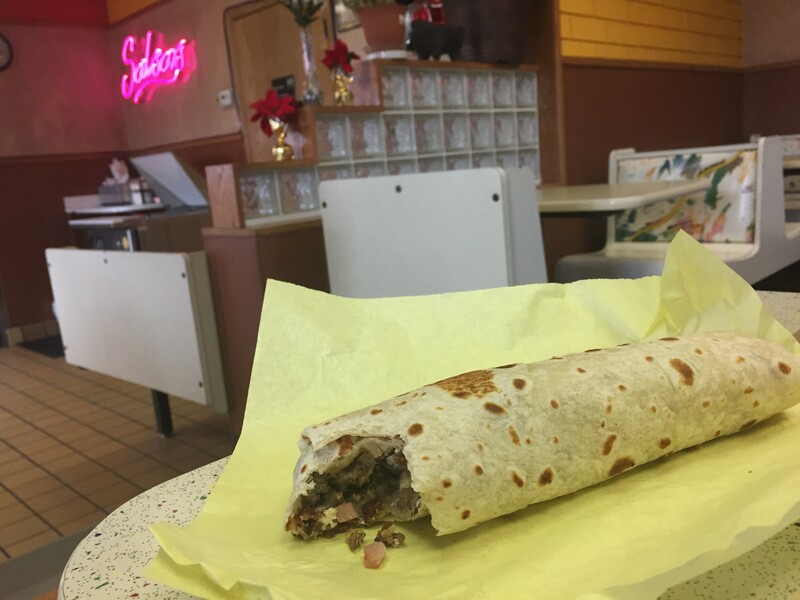 Beto's was my entry point into the world of comfort burrito joints, and I will forever maintain that their version of the Texano burrito is the best one on the market. When it came to their breakfast burrito, however, I was a little disappointed. Each bite found me searching for the ham, eggs and cheese that seemed to be hidden somewhere within all those potatoes. Although the tortillas here are consistently delicious, it was hard to get through such an enormous starch-fest. This guy was a bit of a dark horse on my list. I hadn't visited this restaurant before and therefore had no frame of reference. As I wasn't sure what to expect, I was surprised at the flavor of the potatoes and the ham—there was some magic happening with the pre-cooking before they met their final, tortilla-wrapped embrace. Most, if not all, the burritos on this list include potatoes as more of a supporting role, but the potatoes at Floriberto's had been loved just a bit more while they were on the grill, giving them a more flavorful exterior. The same pleasant char was present on the ham as well, which could have pushed this burrito into the No. 1 spot if the tortilla wasn't a bit too blonde. Perhaps I just got a fluke, but an underdone tortilla is an underdone tortilla. This particular location has a special place in my heart—it was a go-to late-night hangout for me and my friends while I was living with my folks during my first few years of college. I will always extol the virtues of Gual Berto's carne asada fries, but their breakfast burrito is strictly middle of the pack. The main problem is that their ham cubes aren't as generously endowed as those on their cousins' menus. The ham needs to hold its own in a solid breakfast burrito, but that's hard to do when it's spread as thin as it is here. Outside of that, however, this breakfast burrito is solid—especially since it's on the cheaper end of the list. Where others had missteps on the potatoes or the tortillas, none were as disappointing on the ham front as the burrito from Willy Berto's. The egg, cheese and potato ratio was all good, but there was something undeniably packaged about the ham's flavor here. Rather than merge harmoniously with the other ingredients, the hot dog flavor of the ham became more aggressive with each bite. A bit of time on a hot griddle would do wonders to improve this modestly priced offering. This is the one to beat. I used to live near this particular Rancherito's, so I'd swing by for breakfast fairly regularly. Every time I ordered their breakfast burrito, it was near unto perfection. The secret to this burrito's success is the fact that the trademark gobs of melted cheddar cheese are evenly distributed throughout the fluffy scrambled eggs, creating the ideal backdrop for the cubed and grilled ham. As ingredient ratios make or break a burrito, this beast achieves a harmony that the others just don't quite nail. Plus its price point puts it on the cheaper end of the spectrum—this is the most burrito bang for your buck that you can get.